At Mr. G's, every slice we serve is filled with family pride. We use the freshest ingredients, original recipes, and only the finest imported Italian cheese. Our crust is light and crispy. Unlike all others. All this combines to give you a dining experience worth remembering, each and every time. Mr. G's Italian Pizzeria can cater to your every dining need; whether it be a business lunch or a private upstairs banquet. 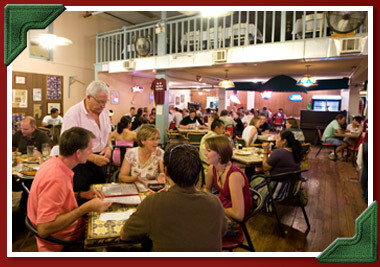 Our free WiFi and downtown location makes Mr. G's the optimal dining experience for business meetings or lunches. 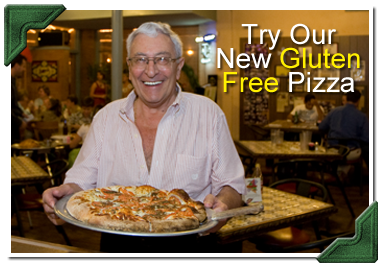 Some may claim they serve "gourmet pizza", but at Mr. G's we want you to be the judge. Try us and we think you'll agree that we truly do serve, "The World's Best Pizza!". Visit our About Us page to find out more. Don't just take our word for it, see our Testimonials page to find out what others are saying. While you are there, send your own comments to Mr. G.
For a full listing of all our pizzas, calzones, appetizers, and desserts take a look at our online menus. You find it full of your favorites and you may see some Italian specialities that you have never tried before. Our standard menu items are complimented by our daily specials and Authentic, rustic Italian recipes straight from Italy. Click here to learn more about the Best of the Brazos. Mr. G's in Bryan, Texas cannot be beat.